Last Saturday night, June 7, the Earth and moon made a pretty sight as seen from Mars. Over the next few nights, the full moon will be riding low in our summer sky. The summer solstice will occur Saturday (June 21), so the noontime sun is nearly at the highest it can get in our Northern Hemisphere skies. This puts the full moon, occurring just after midnight Eastern Daylight Time on Friday the 13th, at close to the lowest it can possibly get this week. As far as the naked eye is concerned, the moon looks full for a day or two on either side of the exact "full" phase. Only with a telescope can you see that the moon is being lit from a slight angle, causing the line of sunrise or sunset on the moon, called the terminator, to be very close to one edge or the other. The result is that any night this week will look like a "full moon night." An interesting event involving the moon occurred last week on Saturday (June 7). To viewers on Earth, it appeared as if the moon was very close to the planet Mars, what astronomers call a "conjunction." This was of course just an effect of perspective, Mars actually lying 320 million times farther away from us than the moon. It's interesting to view this conjunction in the other direction, looking at the Earth and moon from the perspective of Mars, which can easily be done with stargazing software such as Starry Night. Our computer can transport us to the crater Dawes on the surface of Mars, named after 19th century British amateur astronomer William Dawes. 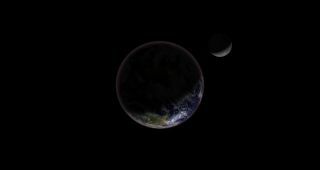 Looking back toward Earth, we would see Earth as a bright object in the dawn sky. The moon would appear so close to the Earth that it would require a telescope to see them as separate objects. To give you some idea of the scale of this view, the Earth would be 21 arc seconds in diameter, about half the diameter of Jupiter as seen from Earth. The moon would be 5.7 arc seconds in diameter, smaller than Mercury appears from Earth. The distance between them would by a mere 5 arc seconds. If you were to take a closer look at the moon, you wouldn't recognize a single feature. That's because you would be looking at what we call "the far side" of the moon. Our moon, like all moons in the solar system, always keeps the same face inward. On June 7, the moon lay almost exactly between the Earth and Mars, so the face of the moon toward Mars would be the face of the moon we never see from Earth. This article was provided to SPACE.com by Simulation Curriculum, the leader in space science curriculum solutions and the makers of Starry Nightand SkySafari. Follow Starry Night on Twitter @StarryNightEdu. Follow Space.com on Twitter @Spacedotcom. We're also on Facebook & Google+. Original article on Space.com.